Meg's team has a new pitcher. Megan. She did pitch an inning last week after the reds and I left. Her team was playing a double header and they only had one pitcher because the second one got hurt and is out for the rest of the season. So the coach was letting all the girls that wanted to pitch have a turn. Meg got a turn and the coach let her go longer than the others because she was actually throwing strikes. Yesterday Mickey got an e-mail from the coach saying Megan was pitching tonight's game. She's been practicing and did pretty good tonight. She struck out 4 girls. 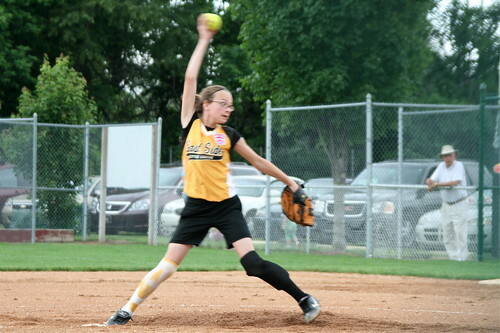 And walked quite a few but she made it through 4 innings with only giving up 7 runs. I know that sounds like a lot but our team was stopped by the seven run rule for the first two innings. It was a long game. Congratulations Megan! That's great! Sorry we missed it! We'll see you later this week at one of your games. Wow! What an awesome picture! Good work Megan!